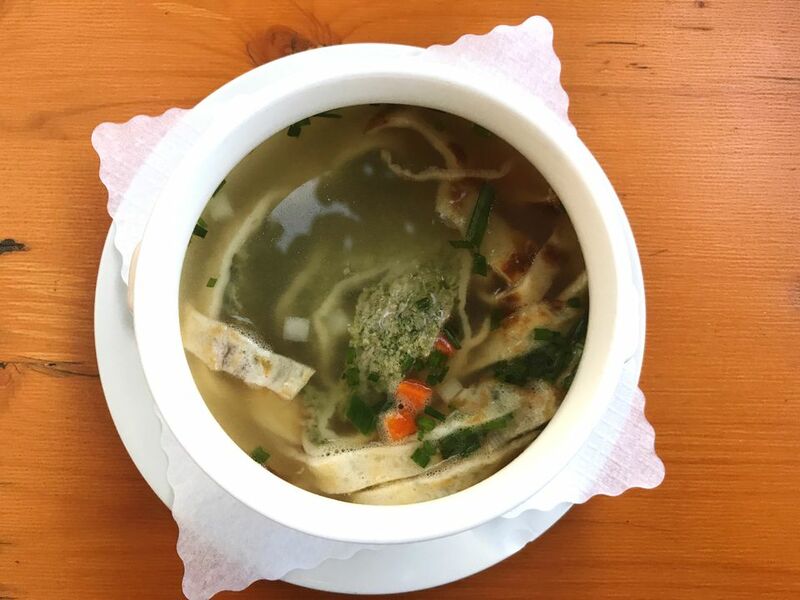 Wedding soup in Germany has many regional variations but the most common is a clear broth with various garnishes. "Hochzeitssuppe", or Wedding Soup" is fun to make but takes time, so it is mostly made for special occasions. These soups made with clear broth are usually assembled by placing cooked ingredients in the individual bowl, then pouring hot broth on top and serving immediately. Cooking the ingredients in the broth would cloud the broth and some of the ingredients will fall apart with intense handling. Assembling the soup is therefore best done by creating an assembly line of sorts in the kitchen and having a helper serve the soup as it is created. This is easy in a restaurant but a home cook will be less familiar with this method. On the good side, with the assembly line method, each serving contains the same amount of each garnish and can be arranged especially attractively. Start the broth the day before. You may choose to skip making the broth entirely and buy 2 - 3 quarts of a good quality, packaged broth instead. Place all ingredients except salt for the broth in a large stock pot and cover with 4 quarts of cold water. Bring to a boil, lower the heat and add the salt (start with about 1 tablespoon and don't add more until the end, because the evaporation could make it too salty). Simmer over low heat for 4 hours, skimming the scum as necessary. Remove meat and vegetables. You may choose to eat them in another meal or discard. Most of the flavor was extracted into the broth. Run the broth through several layers of cheesecloth to filter the fine particles and refrigerate broth. The day of the special meal: Remove any hardened fat from the top of the broth. To further clarify the broth you may use 3 egg whites. Place them in the cold broth and stir as the broth comes to a simmer. After a few minutes, strain the broth again through cheesecloth into a clean pan. The egg whites trap other proteins and sediment. Heat broth shortly before serving time and keep very hot, but not boiling. Using 2 eggs and 2 egg yolks with 1 cup of milk or cream, prepare the "Eierstich" according to the directions in this recipe. Cool and cut into bite sized pieces shortly before serving. Each vegetable you choose to have in your soup should be cut small. Half inch dice or small florets that fit on the spoon and in the mouth. Everyone can fight over which vegetables should be included, but in the springtime it is usually white asparagus and carrot (for the color). Boil the vegetables until al dente, leaving the carrot until last so it will not discolor the others. You may also cook them with any method you like. Keep them separate and warm. Bring a pot of water to a simmer. Mix the ingredients for the meatballs thoroughly. Form small meatballs using about 2 teaspoons of meat. Drop them in the water and cook for 5 - 7 minutes. Drain and keep warm. You should have about 32 meatballs. Boil about 1 1/2 cups of plain, wide egg noodles to make 2 cups of cooked. Make an assembly line with each ingredient and the hot broth at the end of it. Place the ingredients attractively in the soup bowl (See example). Use 4 meatballs and 4 pieces of royale per bowl, about 2 tablespoons of carrot and other vegetable, and 1/4 cup of noodles. This is an appetizer, it need not be filling. Ladle about 1 cup of hot broth over the soup, garnish with parsley and/or chives and carry to the table and place in front of each guest. After everyone has a bowl, they can begin eating. When done, you may choose to distribute leftover broth to those who want it. Bread is not usually served with this soup, but you might choose to have some on the table. Bread is usually not served with butter for first courses.